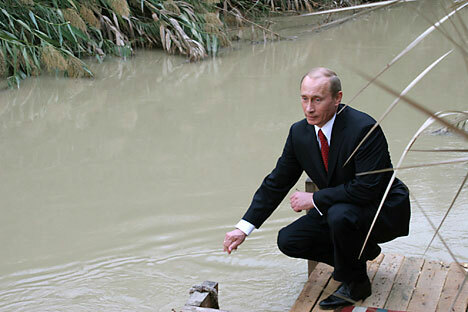 Can Putin succeed to step into the same river three times? Putin will have to organize a Russian economic miracle relying on new social strata — entrepreneurs and the middle class. This in turn will entail profound political changes. In his interview with the directors of Russia’s top three television channels, President Dmitry Medvedev attributed his decision not to run for a second term to the ratings. Prime Minister Vladimir Putin’s rating is higher than his, he said, therefore Putin will run for president in 2012. A perfectly logical explanation. The president’s rating has fluctuated over the last four years, as has that of the prime minister, but Medvedev’s rating has always been lower than Putin’s by at least several percentage points. In a March 2011 poll, the gap between Medvedev and Putin was 11%. Of the poll’s respondents, 22% were ready to vote for Medvedev in the next presidential elections, 33% for Putin, and 14% for a third candidate, while 31% did not plan to vote. So there were three options: Medvedev could be given one more chance on the understanding that he might not do very well, or Putin could be nominated, or the tandem could be “split up”. The variant of “another successor” was highly speculative. In the event, the ruling tandem settled on the most conservative option. Barring anything unforeseen, Putin should win the election in March by a landslide against his perennial opponent, Communist leader Gennady Zyuganov. On the other hand, this conservative option involves risks, which Putin has never before encountered. The fact remains: this will be Putin’s third term. Though not forbidden by the letter of the Constitution, which says “no more than two consecutive terms”, it is dubious from the point of view of the Constitution’s spirit. At a recent convention of the ruling party United Russia, Putin admitted that he and Medvedev had agreed on who would do what several years ago. This announcement makes the situation equivocal. It seems to suggest that for four years Medvedev was simply holding Putin’s place as president. The Putin of 2000 and 2004 may have been liked by some and disliked by others, but he was legitimate. The decision to run for a third term may lose Putin some of his base. Some voters, including Putin supporters, may view this “castling” as manipulation. Opinions like these were in evidence already in 2008 during Medvedev’s electoral campaign (“they decided everything without us”, “we have a monarchy”) and now they will be grow stronger. Meanwhile the acknowledgment of a previous agreement will harm the very institution of presidential power. If the office in the Kremlin is something that can be safeguarded until the real master arrives, then it’s not a matter of the presidential post, but of the personal power, which Putin possesses. The current prime minister no longer seems like a novelty. Although people’s trust in him, according to the polls, remains fairly high (51% of all Russian residents trust him, 20% do not), it has steadily decreased since 2008. Another difficulty is that Putin’s main political support, United Russia, is not in the best shape ahead of the elections. And finally, Russia is witnessing an industrial downturn. If the worst forecasts concerning how this situation may develop come true, this will be the first federal election campaign in twelve years to take place against the backdrop of a downturn. Demagogy aside, there is one grievance that one can have against Vladimir Putin as a state administrator: his having built patron-client networks based on personal trust. On the other hand, given the political chaos in Russia at the end of the 1990s and the prime minister’s resume, that approach seems understandable. Putin’s critics naturally claim that for the government the most important areas of economic development (and, therefore, budget expenditures) coincide with the business interests of Putin’s clients. Other observers with better judgment say just the opposite: Putin’s clients are forming up in accordance with his chosen priorities. Yet the real problem in Russia today is that other mechanisms of implementing economic policy are simply impossible. Only patron-client scenarios can work. This is deplorable, but it is a fact. The main alternative — the liberal recipe that would “privatize everything, and let the invisible hand of the market build us a new economy” — was entirely compromised by reforms in the oil and power-engineering sectors: everything was divided up and privatized, yet prices and tariffs continue to rise by leaps and bounds making Russian enterprises unable to compete with foreign firms. Appeals to save resources are foiled by one simple fact: introducing fuel-efficient technologies requires major amounts of investment, which today no one but the government is capable of financing. Evidently, Vladimir Putin’s clear sense of the costs of the two approaches cited above is forcing him to use “manual controls” to run the economy. To implement state projects, people and companies not directly part of Putin’s clientele are enlisted, including “oligarchs of the first wave” — but the prime minister personally controls all operations and decides all matters of an administrative-political nature. However, this sort of approach clearly has its limitations: one man simply cannot deal with all the problems that must be solved for an economic breakthrough. The way out of this “institutional-technological” impasse has been delineated by Putin himself: the creation of a “genuinely mass” middle class, meaning “entrepreneurs who create real goods and services”. Those entrepreneurs will be given, first of all, easier access to state orders, secondly, export support, and thirdly, liberalization of administration. To all appearances, Putin was entirely sincere when he said he was convinced that “the key, moving force behind development projects should be Russian business, and primarily that generation of entrepreneurs now showing more and more confidence, creating competitive factories, introducing innovations, and becoming a leader on both the Russian and world markets”. But until this new generation of entrepreneurs has acquired the strength necessary to assume full responsibility for Russia’s economic development, we will have to reconcile ourselves to patron-client scenarios. Unfortunately, post-Soviet Russia has yet to see a mass demand on the part of business and civil society for high-quality state institutions. Modernization in the version of Dmitry Medvedev was a selective project affecting narrow branch and social niches. In this sense, Putin’s current slogans — new industrialization, 25 million jobs in 20 years, economic growth of 6-7% a year — are far more sweeping. Incidentally, the prime minister advanced these first slogans this past May, when he announced the creation of a Strategic Initiatives Agency. It was then that he proposed an essentially new format for industrial policy: to offer fast-growing mid-size companies direct access to the prime minister, bypassing the departmental bureaucratic machines. At a meeting of representatives of such companies with Putin, the discussion revolved around the need to eliminate the obstacles to their growth and facilitate their expansion from mid-size to large companies. Dmitry Medvedev tried to broaden the political support for the ruling group by means of liberal members of society and the middle class. As it turns out, the middle class is indifferent to the traditional liberal rhetoric customary in Russia. It is mainly interested in higher pay and access to housing and education. Meanwhile liberal members of society are not very influential, on the one hand, and, on the other, too radical and inclined to communicate to the powers that be only their constant dissatisfaction. If the new format of economic and industrial policy acquires reality, the support base for the political regime will begin to increase thanks to owners, managers and employees of growing mid-size companies. They will also increase Putin’s clientele. If growth in Russia is not just in raw materials and quick, then sooner or later quantity will turn into quality. Private business will acquire political interests and learn how to express them, thus destroying the bureaucracy’s monopoly on state power. Still, the question remains: will Putin manage in the near future to acquire a new — his third so far — political face?